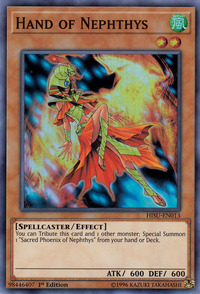 You can Tribute this card and 1 other monster; Special Summon 1 "Sacred Phoenix of Nephthys" from your hand or Deck. Nephthys was an Egyptian goddess associated with birth and death. Hand of Nephthys has A Feather of the Phoenix in her headdress. This card shares counterparts with The Creator Incarnate,Atlantean Tridon and Horus' Servant to summon The Creator, Poseidra, the Atlantean Dragon and any of the Horus monsters, respectively. She is presumably the adult Disciple of Nephthys. Tribute 2 monsters on your side of the field, including this card" means that you Tribute "Hand of Nephthys" plus 1 additional monster. You can chain to the activation of this monster's effect. Tributing monsters is a cost of this card's effect. You can Tribute a Monster Token as part of this card's cost. You can chain to the activation of "Hand of Nephthys" effect with the effect of "Royal Oppression" to negate the Special Summon of "Sacred Phoenix of Nephthys". Junk Synchron: If you Special Summon "Hand of Nephthys" with "Junk Synchron's" effect, when you activate "Hand of Nephthys" effect it will be negated, even if you Tribute "Junk Synchron" to activate the effect.